A rare visitor. Just three records exist for the county, the last one being taken in Welshpool in 2006. Wingspan : M & F, 78-90mm. 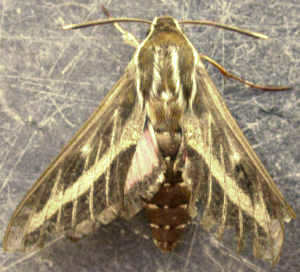 Bedstraw Hawk-moth, Spurge Hawk-moth and Silver-striped Hawk-moth. Open warm sites, especially on the coast and in gardens. Willowherbs, hedge bedstraw, snapdragon, fuchsia, sorrels and docks. Unable to overwinter in this country. Larva June-July and September-October.